Let’s get animated! 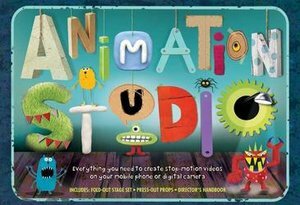 Packed with inspirational ideas and tips, Animation Studio is your one-stop guide to every aspect of stop-motion movie-making. Housed in an interactive reversible mini film set, it contains all the aspiring director needs to know to make successful animations. •This is an easy to follow, action-packed and comprehensive guide to creating your very own animated feature. •Features detailed instructions on how to create animation using just pen and paper, stop-motion clay figures, a digital camera, cell phone or even webcam. •This one-stop how-to guide comes with a 32-pp fully illustrated animator’s handbook, a fold-out box stage with alternative set configurations, press-out Zoetrope and Thaumatrope toys with alternative inserts, an articulated model/puppet, double-sided storyboard sheets with examples, additional set backgrounds and press-out card props and push-on features.